When you join or renew your annual membership to The Marine Mammal Center, you become part of a community of amazing people who have a passion to save marine mammals and their ocean habitat. 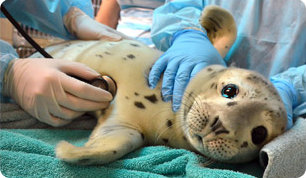 medicine and care for sick, injured and orphaned marine mammals. Membership starts at just $25 per year, or $5 a month! From just $5 a month you can give marine mammals regular and reliable support. You can easily manage your online payments and help reduce mailing costs. It really is the best giving option for you, our patients and the planet! Provides 25 pounds of fish for our hungry patients, and gives you core membership benefits for you and a guest. Covers the cost of an admit exam and a meal for a patient (essential for their care!). Membership engages the whole family and benefits two adult cardholders and up to four guests. Gives five orphaned pups meals for a day and gives you the chance to attend a rehabilitated animal release event and to take a private tour. Benefits are for two adult cardholders and four guests. Your donation provides critical care for multiple animals. Benefits feature an opportunity to attend a private animal release and is valid for two adult cardholders and four guests. The Chairman’s Circle is comprised of a select group of individuals who help guide the direction of the Center. Find A Membership That's Right For You: COMPARE MEMBERSHIPS! Being a member of The Marine Mammal Center is much more! By joining our "club", you'll be sharing your passion for marine mammals and ocean conservation, learning more about what we do, getting closer to life at the Center, and helping fulfill our shared mission to expand knowledge about marine mammals, their health, and that of their ocean environment (while enjoying exclusive member-only benefits along the way)! Whatever level of giving you choose, your kindness is invaluable to our patients. Make a difference. Join the Club. Become a Member today! Among the many benefits of membership is a 50% discount off the admission price to the Waikiki Aquarium in Honolulu, Hawaii. Be sure to bring your membership card to receive the discount. *Guests and children must accompany named cardholders to receive benefits. Membership is tax-deductible.